Property 11: ‘Cedar Cabin’ Cozy 1BR Packwood Cabin w/Mtn Views! Property 12: Great Cabin in Packwood w/ WiFi , HBO and RoKu. Property 18: Near White Pass for skiing, wood stove, and jacuzzi! Property 23: A Well Kept Secret. Great for Skiers, Hikers, or Romantic Getaway. Property 24: Book Now for Winter Getaways at Mountain Retreat! So Close to Winter Recreation! Property 25: ‘Log Cabin’ Cozy 1BR Packwood Cabin w/ Mtn Views! 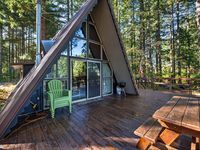 Property 28: Cozy Cabin in Packwood w/ WiFi , HBO and RoKu. Property 30: The Elk Run Lodge-close to town, hot tub, game table, Apple TV and fire pit. Property 32: 'Grizzly Tower' Packwood Cabin w/ Forest Views! Property 36: This Rock-N-Roll Cabin Is Quaint and Super Fun. Property 37: Don't Settle for LESS than the BEST! Property 44: Welcome to Bearadise Shack, where you can get away from it all! Property 46: NEW LISTING! Stunning Creek-Front Cabin, Just Minutes From Mt. Rainier! Property 47: Mt Rainier Couples Cabin - Open Year Round! Property 48: Secluded Mt. Rainier Cabin - Wifi - Wood Stove - Snowshoes - Great for couples! Property 50: Romantic Get-A-Way For Two! We loved everything about this cute, little cabin. Beds were comfortable. Hot tub was great after a day of skiing. 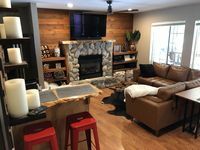 The cabin had so many little touches that were appreciated (adorable decor, comfy blankets, fire pit, smore's kits, games, lots of small kitchen appliances, smart technology). The cabin was clean and ready to go when we arrived. Owners were friendly and flexible. If we have the chance, we'd definitely stay here again. We chose this cabin for a quiet get-a-way weekend. It is located in an community of other rental cabins and a few homes. This time of year there was not many others about, so it was definitely quiet. The cabin is well kept and has everything you need - dishes, pans, coffee maker, microwave, full size refrig. etc. , you only need bring food. I would bring dvds or books if you are planning just to relax and like some entertainment as the wifi and cable were not working while we were there. You can drive into Packwood (only 5 minutes away) to get your phone messages etc. Also if you cannot navigate steep narrow stairs this cabin would not work out for you unless you want to sleep on the hide a bed on the main floor as the bedroom is upstairs. other than that everything else is on the main floor. It has a nice big deck with a Weber Grill if it's nice out. It's close to pass for skiing or just over an hour to the Nisqually Entrance into Mt Rainier (Paradise, Longmire), as well as many other trails.